It is difficult to overstate just how much of an influence Dutch football legend Johan Cruyff has had on the sport. From his time on the pitch, starring for Ajax, Barcelona and the Dutch national side, to his time in management at the same institutions, Cruyff has always been at the cutting edge of football development. Winner of the Ballon d’Or an incredible three times, Cruyff started his footballing career at Ajax, where he led the Dutch giants to eight league titles and three consecutive European Cups in 1971, 1972 and 1973. Winner of the Ballon d’Or an incredible three times, Cruyff started his footballing career at Ajax, where he led the Dutch giants to eight league titles and three consecutive European Cups. He joined the club aged 10, and was a talented baseball player alongside his football development until he decided to concentrate on football at age 15. 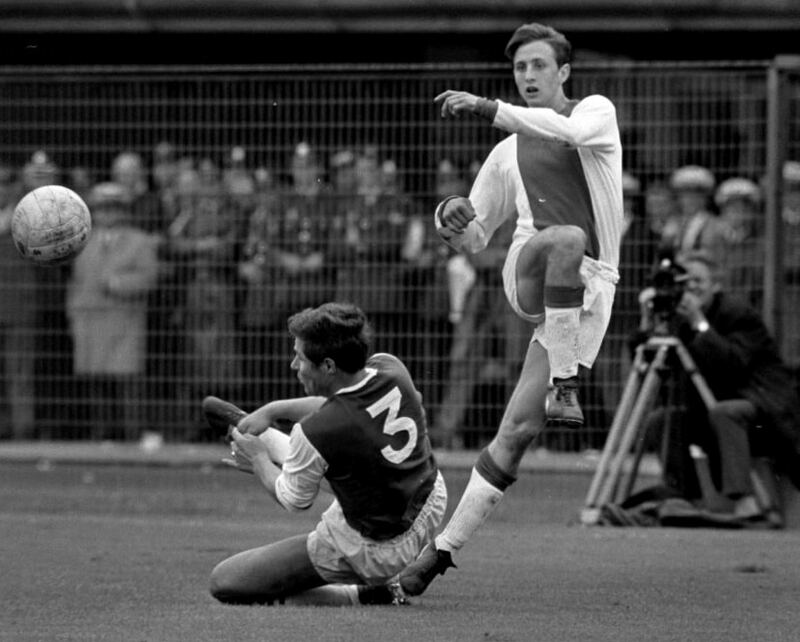 He first established himself in the Ajax first team aged 18 in 1965–66, a season in which he scored 25 goals in 23 games as Ajax won the championship. In the early 1970s came the incredible run of three consecutive European Cup wins between 1971 and 1973, with Cruyff scoring twice in the final of the 1972 competition against Internazionale. In 1971 Johan had been named as European Footballer of the Year. 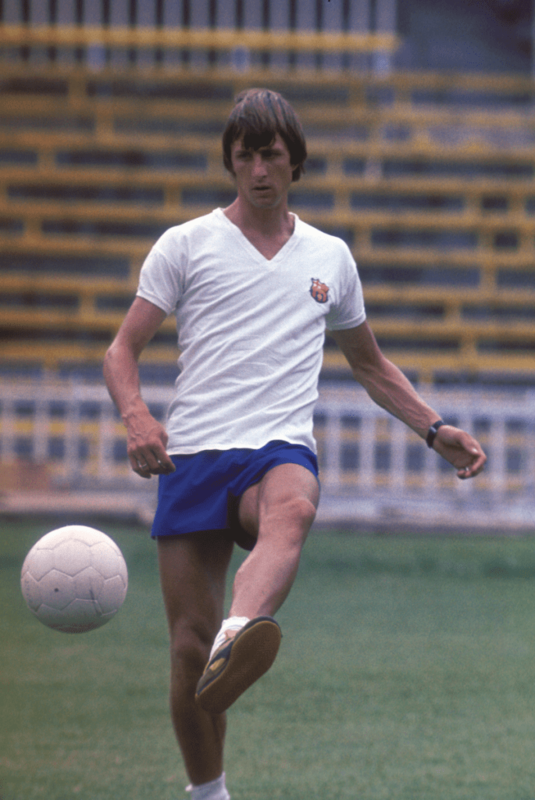 Following the 1973 European Cup win, Johan moved to Barcelona in a world record-breaking transfer. He immediately made an impact and helped the Catalans to their first league title since 1960. It was with Barcelona that he was twice named European Footballer of the Year, in 1973 and 1974. In 1974 he led the Netherlands to the final of the World Cup, picking up the Player of the Tournament award along the way, and upon his retirement from international football had scored 33 goals in 48 matches. Incredibly, the Dutch never lost a match in which Cruyff scored. It was during his time at Ajax that he was instrumental in the development of the ‘Total Football’ playing style. Pioneered by coach Rinus Michels, the system involved a fluid movement of players in all positions, keeping the team’s structure without players having to keep to defined roles. The system required a singular type of leadership on the pitch – a role in which Johan Cruyff flourished. ‘Cruyff Turn’ was born. The unique skill became an instantly recognisable trademark and is still copied on training pitches and playgrounds the world over. As a style of play, Total Football not only defined the era, it influenced the path of football forever – and Cruyff is still regarded as the figurehead. When his playing career finished in the early 1980s, following spells playing the US, Spain, and back in Holland with Ajax and Feyenoord, Johan went into management with Ajax. Again, Cruyff’s development of a fluid playing style was instrumental in getting the best out of his players, and it was using this same system that Ajax won the 1995 Champions League under the management of Louis van Gaal. In 1988 Cruyff became manager of Barcelona, another club where he’d excelled as a player, and led the Catalans to four league titles and – incredible though it may seem considering their current status – their first European Cup win in 1992. While at Barcelona, he founded and pioneered the development of La Masia, the club’s now legendary Academy. Based on his experiences of the Ajax Academy, La Masia was tasked with instilling Cruyff’s philosophies in the club’s youth players – players who would one day become the world’s best exponents of ‘tiki-taka’, a style that evolved from Total Football and would lead Spain and Barcelona to the pinnacle of world and club football. Many of those players who began their development under Cruyff, many part of the early 90s ‘Dream Team’ at Barcelona, are now leading managers in world football (such as Pep Guardiola) and continue to instil those same ideals. Today, Johan Cruyff remains a hugely influential figure in the game and maintains a love for developing young players through the work of his Foundation and Cruyff Football. The Foundation has provided nearly 200 ‘Cruyff Courts’ around the world to allow children to play street football together. We caught up with him to find out more about his thoughts on player development and how he hopes his philosophies will impact future players. PDP: Why do you place so much importance on youth development? JC: It all starts with the youth. It has to be fun for them or it makes no sense. Young players are eager to learn and they will dream of playing on the first team, so motivation is already in place. If you have proper training and coaching in place, then these youngsters will learn to dominate the ball and also learn about position play. Latest blog via Player Development Project from Canadian contributor, John Haime. John discusses ten practical steps to help your players build their football confidence. PDP: WHO WAS RESPONSIBLE FOR MAKING YOU A CHAMPION? JC: I had a youth coach, Van Veen. He was hard, very straight, but he was always helping, even if you did not think it was help at the time. I never knew I was successful because he would take me out of success and put me into the next challenge, always adding something. Looking back now I realise how good he was. He had great vision. He could see the qualities of each player. He knew I failed physically so he devised an individual and functional training for me. We did not have modern gyms so I would have to carry a teammate – first someone of 50 kilos, then 60 and so on. Little by little I got stronger, and with special sprints he made my first metre quicker. He knew that I could never be a physical player like some others, but he still made me work on my weaknesses. PDP: When you made the transition to coaching, what did you look for in a player? JC: Maybe the most important thing is what you see in somebody. You need to pay attention to where he comes from; you need to see his character. You also need to see his habits – how does he behave and what can he handle? PDP: Why do you place so much emphasis on the habits of players in addition to skills? JC: There are a lot of players who can kick a ball or do tricks and still never make it. That is because their habits are poor. They do not take care of all the other things that matter – like their behaviour, preparation and mindset. You have to take care of these things and the youth coaches have to help mentor young players. Those who make it need to be intelligent, and those that do not play professionally need to be able to care for themselves and their family. We have a responsibility to educate these young players in the right way. PDP: So in football today how does a club or federation create the next champions? JC: Winning and losing is a matter of being competitive. You cannot expect to win every match, but you can control your ability to compete. And if you have a path for young players to follow then you will always have players who can compete. I have been in football for a long time and in the end we can only set the stage for the players to win and then they must enjoy going out to become champions. We develop them and they perform when it matters most. PDP: What do you hope to accomplish through Cruyff Football and this publication? JC: Young players today grow up in a completely different world than my days in Amsterdam. But the game is the same. It should be about what it was about for us back then – fun. You can test yourself against your friends, your neighbors and maybe someday even against the world’s best. We want to help children reach their potential and then see where they stand relative to other players. We must be patient and we must focus on developing good players and good people. If we can help clubs and countries do that, then I think we have accomplished something important for the children. 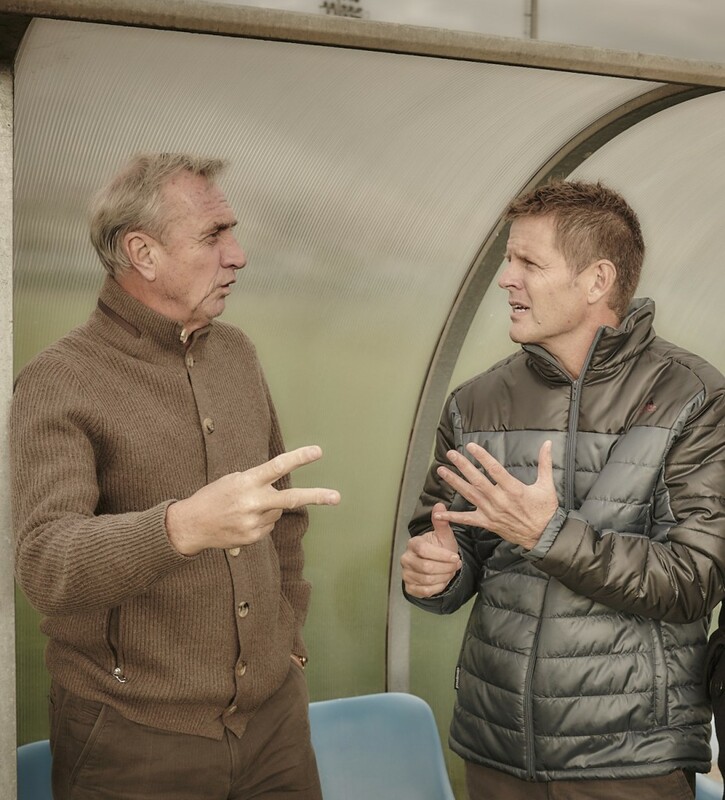 Johan Cruyff (left) with Todd Beane during a recent visit to FC Barcelona.